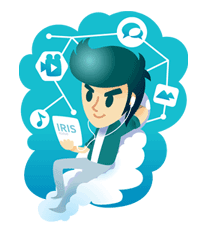 http://www.line-stickers.com/ – IRIS & ILARN Line Sticker | Proudly presenting “IRIS”, a cool tech geek, and “ILARN”, an adorable nerd! They are sure to make you smile and laugh! Publisher : CAT Telecom Public Co.,Ltd.